Last Friday I experienced some of the hottest temperatures that I have ever felt on my fair Canadian skin. Sydney peaked at a sunny 45 degrees celcius. Granted, that is only five degrees hotter than the bikram yoga room… however, Bikram yoga is practiced at that heat to make you SWEAT, and sweat A LOT, but I usually don’t go about my daily routine in the hot room. And furthermore, I wear signicantly more clothing when I am outside a Bikram class. So… five degrees is like, ridiculous. I don’t even know how to explain it. Really hot is pretty much it. Anyway, Sean and I decided that an after work swim was in order… so at around 7pm we drove to the Eastern Beaches. When we got in the car the temperature had already dropped to 35 and by the time we reached the beach ten minutes later it was 24. YOU GUYS! What… the WHAT? We took a dip anyway as the sun was setting and I was actually shivering. It’s a strange country I live in these days. Let’s talk about summer food! 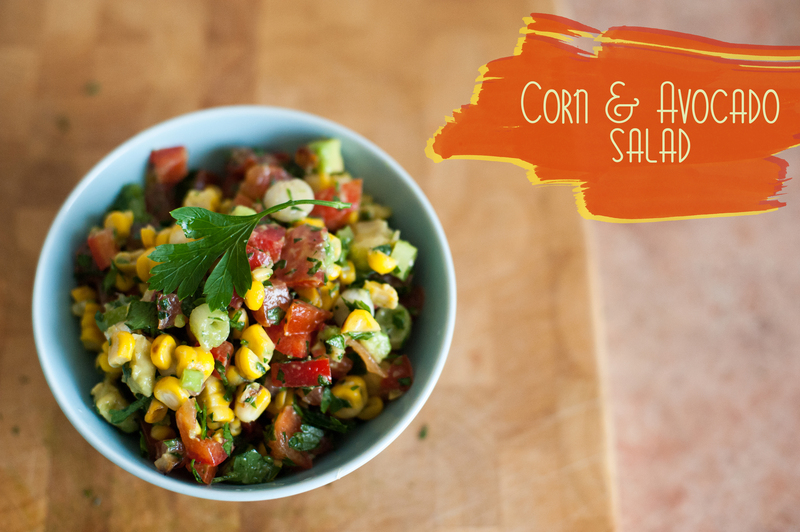 Summer salads… BBQs… light… fresh! I got this recipe from my boyfriend’s mom. I swapped a couple of ingredients and kablammy! 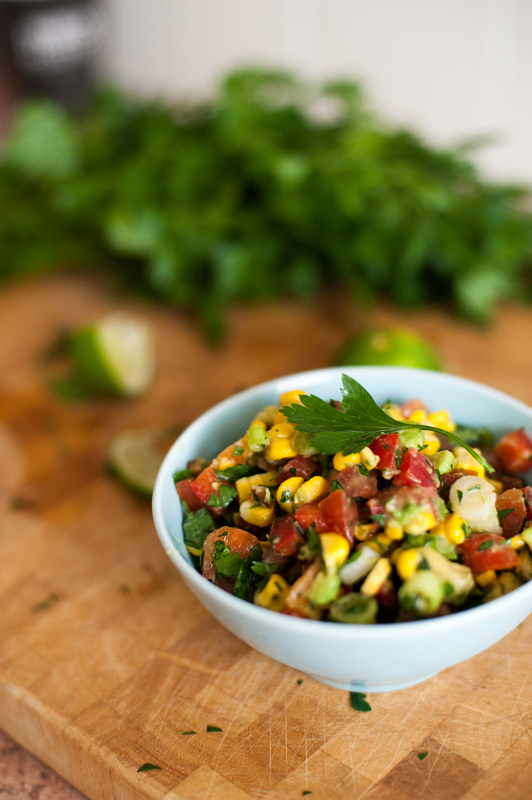 A delicious summer salad/salsa thing that is delish. This salad is pretty straight forward. First cook the corn. I BBQd mine cause I prefer that taste, but you can boil it also. Set it aside to cool. Quarter the tomatoes. De-seed them and sprinkle with a tiny bit of salt. I find that this helps them to dry out a tiny bit so the salad doesn’t get watery. Chop the spring onions, red capsicum, and avocado. Chop the tomatoes quite small and cut the corn off the cob. Finely chop the parsley and toss everything in a bowl with the juice of one lime. Season to taste. well that’s a lovely thing to say!